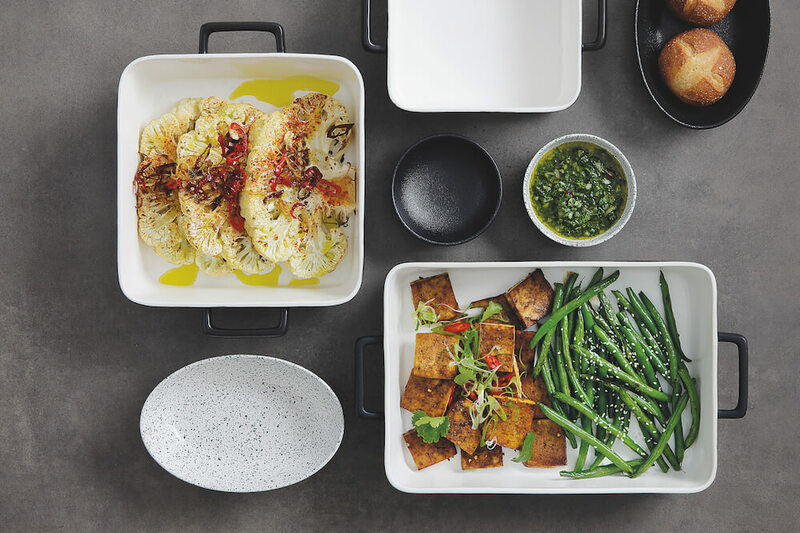 Designed for easy entertaining, bake and serve these oven-to-table dishes with the Maxwell & Williams Epicurious collection. 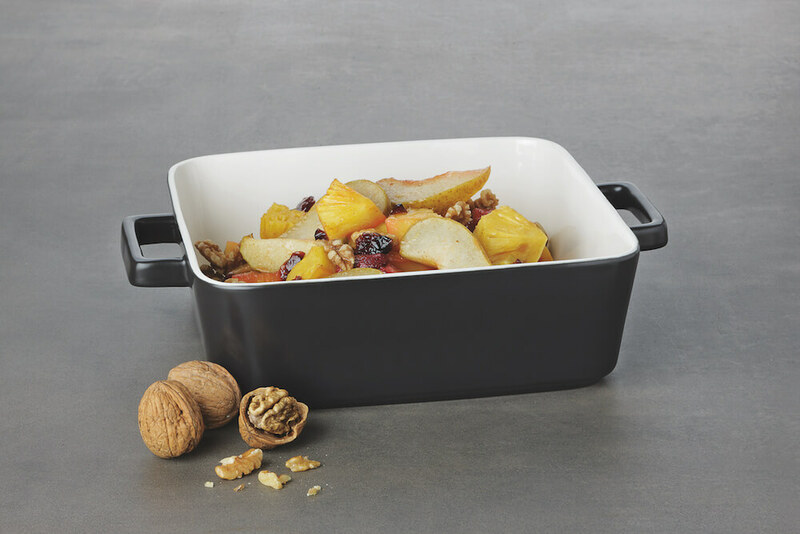 Made from quality porcelain and featuring classic bakeware shapes with contemporary handles, it makes even the simplest fruits and vegetables look and taste good. In a medium bowl whisk together honey, Chinese five spice, 1 tablespoon sesame oil, chilli flakes, garlic and soy sauce. Add in tofu squares and using hands, lightly toss and set aside for 20 minutes to marinate. Place tofu into an Epicurious rectangular baker and roast for 20 minutes. In a medium size bowl toss together beans and remaining sesame oil. Remove tofu from oven and push onto one half of the dish. Add green beans to the other half of the dish and return to oven for a further 25 minutes or until beans are cooked through. Remove from oven and garnish with spring onion, sesame seeds and red chilli. Serve immediately. Cut cauliflower into 1.5cm thick steaks. Place into an Epicurious square baker and brush each steak with olive oil. Turn and repeat. Sprinkle with pepper, salt, smoked paprika and cumin. Place into oven and roast for 30-35 minutes or until browned. In a small saucepan pour ¼ cup olive oil and place over a high heat. Heat for 1 minute and toss in 1 red chilli and brown onion. Fry for 2-3 minutes and using a slotted spoon, remove from oil and place onto kitchen paper to dry. For the chimichurri, place coriander, parsley, red onion, green chilli, red chilli, garlic and remaining olive oil in a blender and pulse for 30 seconds. Remove cauliflower from oven, drizzle with chimichurri and garnish with fried chilli and onions. Serve immediately. Place agave, cinnamon, coconut oil and butter in a small sauce pan over a medium heat for 2-3 minutes stirring constantly or until mixture is combined and melted. In a large bowl place apple slices, pear slices, pineapple cubes, cranberries and strawberries. Pour in melted butter mixture and gently toss. Transfer into an Epicurious baking dish and bake for 20 minutes or until fruits are lightly browned. In the meantime, place custard powder into a medium sized saucepan and pour in milk. Whisk together until smooth and free of lumps. Place saucepan over a medium heat and continue stirring for 3-4 minutes or until thick and remove from heat. Remove fruit from oven and serve with warm custard.